For anyone who doesn’t know, here’s a clip that describes some of the basics behind Black AMEX, followed by a clip of a cardholder opening a new Black Card fresh from the mail. Starting in the 80’s, there was a rumor that American Express had a privileged card for the wealthy elite that could be used for luxurious lifestyle perks. 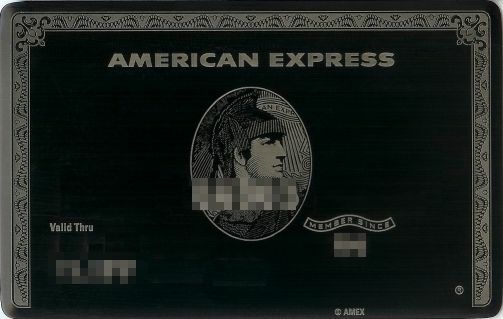 However, the rumor didn’t become reality until 1999 when the Black AMEX was born. The Black Card has worked its way into pop-culture: it’s all over the Internet, mentioned in lyrics by hip-hop artists, written about by major media. If you live in America you live in a country that is obsessed with status and money. Officially named the Centurion card, Black AMEX has a joining fee of 5,000.00 USD and an annual upkeep fee of $2,500.00 USD. However, the card is by “invitation only.” Of course, the invitation assuredly comes with spending at least $250,000.00 USD in one year and then paying off that money by the end of that year. Further, you already need to have an AMEX Platinum or Gold card, and naturally an exceptional credit score. Once you have met all of the requirements American Express sends you a box containing the card even when you don’t specifically request it. Initially, the card was standard black credit card plastic. However, since 2006, American Express has been manufacturing the little beauty using anodized titanium. This gives the card a substantial, heavy feel, which reminds you of the fact that you’re not using just any ordinary credit card when making purchases with it. As for some of the benefits of being a Black AMEX cardholder, you get a dedicated concierge and travel agent. The concierge services allow cardholders to submit requests for tickets, dinner reservations, and shopping research worldwide. Just as there is no limit to the card itself, there is no limit to the requests you can make of the concierge, so long as you have the means to support your ideas. Another perk of the card is complimentary companion airline tickets on international flights, personal shopping assistants at selected retailers, access to VIP airport clubs, automatic first class flight upgrades, membership in Sony’s Cierge personal shopping program, and memberships in various elite shopping clubs. Moreover, there are special hotel benefits including free extra nights or upgrades, and the occasional arbitrary gifts given throughout the year. Some members have received surprise gifts such as Canon PowerShot SD850 digital cameras, $2000.00 USD Judith Ripka gift cards, $1000.00 USD Van Cleef & Arpels gift cards, tote bags, Gucci gift cards, $1000.00 USD Mikimoto gift cards, and the list goes on. Why would American Express spoil its elite members so? Because their wealthiest cardholders are their lowest-risk members while simultaneously generating the highest profits on an individual basis. However, given the rare breed of Black AMEX holders, there are only an estimated 20,000 cards in existence.